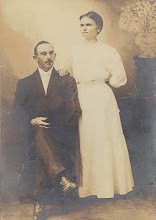 Louann Lightner is a 3rd great grandparent through my father's paternal side. It is also through Louann that I can claim my ancestry from the Mayflower. The research on Louann was done by my great-grandmother, Ruth Butler Burnett, whose work compiles the bulk of this line. I also received a wealth of information from my second great-grand uncle, Adrian Lightner Johnston, who wrote a book on this line available in the Library of Congress. I say that I have a wealth of information on Louann Lightner, but all I really have is the basic facts: birth, children, where she lived and death. Louann was born October 24, 1844 in Russiaville, Indiana, a small city not far from Kokomo, Indiana. She was the third of six known children to Daniel D. Lightner and Polly Seward. 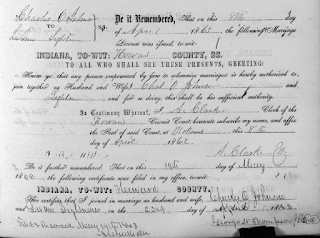 Louann married Charles O. Johnston in Howard County, Indiana on April 22, 1863. Soon after, the couple moved to Hobart, Lake County, Indiana where they lived until their deaths. Louann Lightner Johnston died August 5, 1921 in Hobart, Lake County, Indiana. She is buried in Hobart Cemetery, Hobart, Indiana. I wish that I knew more about who Louann was, outside of the bare facts of her life. To date I have found nothing, but I'm determined to keep looking. 3. Search for her in the Hobart, Indiana newspaper to find out more about who she was. You are on a roll with great ideas. I like how you post what you need to do or find next. That way you keep your focus on the research and not just on cranking out a blog. Thank you, Wendy! You are too kind. You gave me an idea, I need to put all of those loose ends in the same place so I can keep track of them. Thanks!